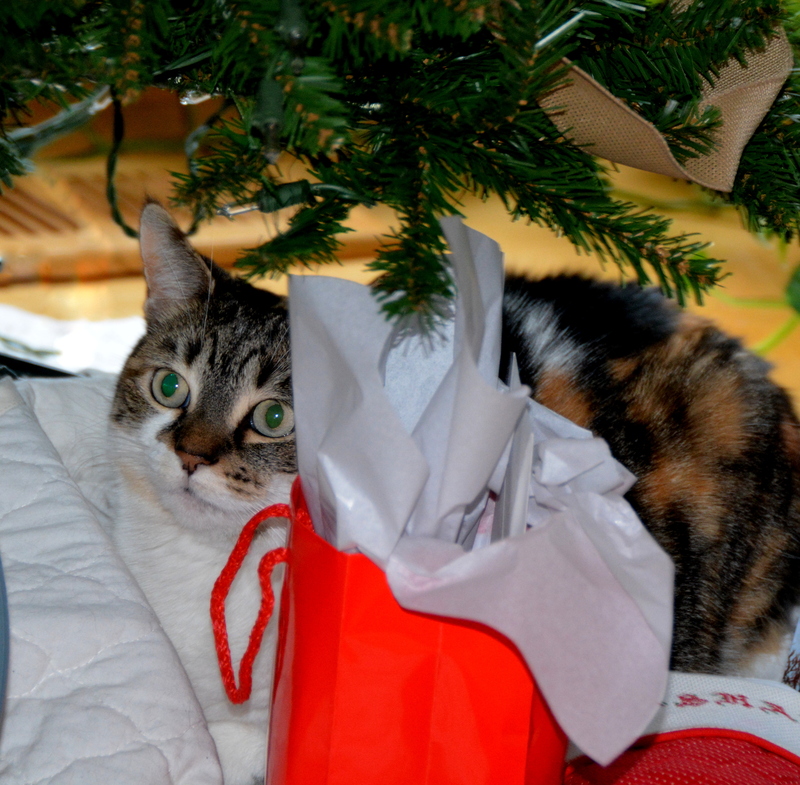 Sundae proves that it isn’t just children who are bright-eyed on Christmas morning. After breakfast at our house with Marshall, Motor Man and I stopped at the shop to see what Santa brought Gypsy. A crinkle tunnel? For me? But I think I like that squeaky mouse-on-the fishing-pole toy over there better. We had a few minutes to catch our breath later in the afternoon, then off to dinner with Motor Man’s family. Marshall visited again that evening for our gift exchange and annual Christmas family photo, of which Sundae wanted no part. Although we didn’t travel far to see everyone, we stayed busy, and by the end of the day, Sundae wasn’t the only one looking tired. How would you describe your Christmas day? Quiet and relaxing? Fun, but hectic? Were you plumb-tuckered out by evening? 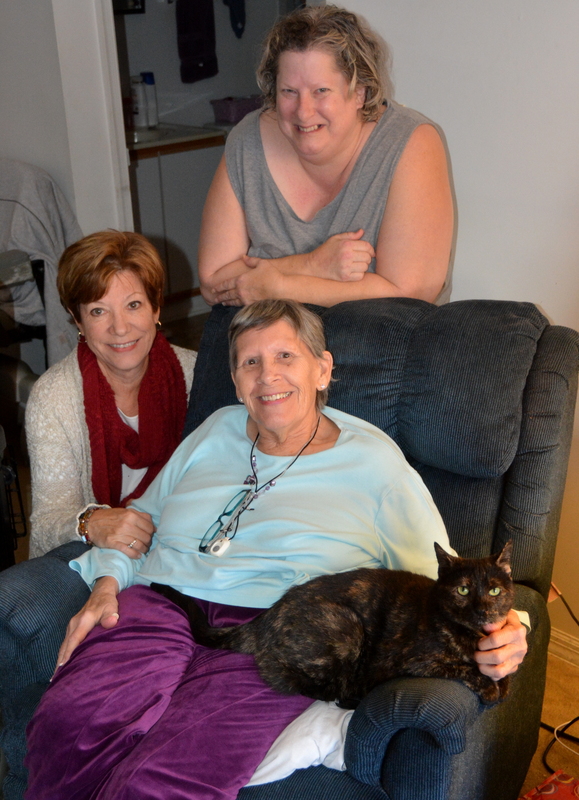 This entry was posted in Days at Home, Family, Gypsy, Sundae and tagged calico cat on christmas morning, family christmas, tabby cat. Bookmark the permalink. As you know, our Christmas was quiet. We sure enjoyed seeing you and JR! Loved all the pictures. 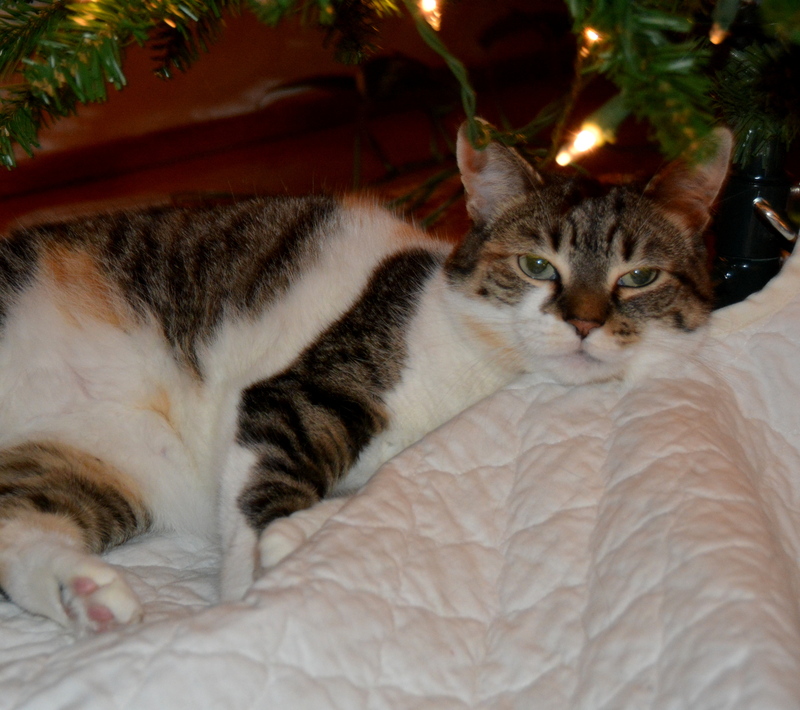 Now where will Sundae spend her time when the tree is gone? Our Christmas was quiet and relaxing. Love Gypsy’s white feeties. 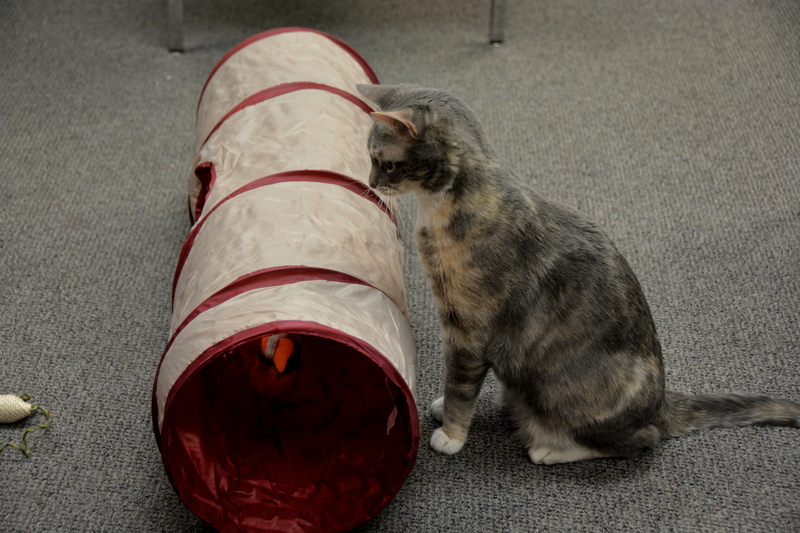 Hope she learns about how fun the crinkle tunnel is. We gave one to our hoomin great nephew.. his Dad loved it 😀 Sundae looks very mellow in the last photo. 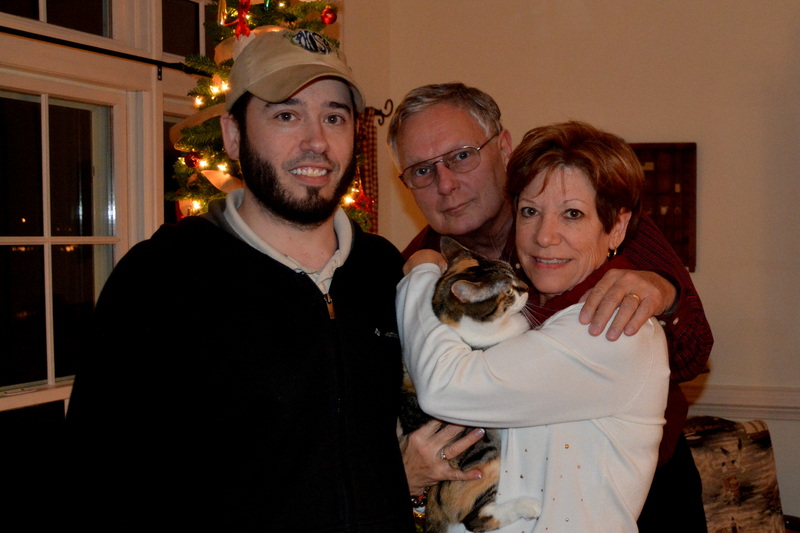 Our Christmas day was laid back and casual—not a lot of hoopla or surprises but it was perfect. We made a nice meal and shared a lot of fun time together and that is all that mattered to me. Loved your pictures. Quiet, Cooking, and then…………….Family!!! Fun! Glad you got to enjoy your family too. Christmas Day was definitely low key and relaxing since we had our family Christmas earlier this month. We traveled to middle daughter’s, went to candlelight service with them at their church on Christmas Eve. Then since son-in-law had to make his rounds at the hospital early on Christmas Day, we just relaxed with daughter and watched Christmas movies (and sang along with all the songs in White Christmas). Christmas to me is all about family and friends getting together. Looks like you did just that! Well, in TN it was just David and I but we did bring our furry family with us. Next year hopefully we will have the kids for Christmas again! It was a good day – all around! ; a little bustle mixed in with the laid-back! Good friends joined us here on Xmas day. Great fun reminiscing, great food and 3 kinds of fruit cake, shopping the days after. Love your pictures! We had a quiet day and a busy evening! Fun but hectic describes our Christmas, with a trip to urgent care for our grandson. you’re a kitty lovin’ crew. 🙂 sweet! Nice keepsakes. Broke, but healthy and happy to be surrounded by caring family and friends. And my two loving kitties. Hoping 2014 slips out quietly. What wonderful pictures! Looks like you had a lovely Christmas! Wishing you a blessing filled New Year! Sounds like a wonderful Christmas. I love that Sundae and Gypsy had a fabulous Christmas. They’ve been good all year and certainly deserve the fun. Sundae is just so cute. – It’s been a pleasure viewing your blog this past year. I look forward to sharing with you in 2015. Wishing you and your family a Happy New Year. Unfortunately, Chuck and I were both down with the flu. First no Christmas in our house in 39 years, but thankful we are both better.